Delos, the sacred island on which, according to legend, the Titan Leto gave birth to the blond Phoebus Apollo, was the religious and cultural centre of the Cyclades. The sanctuary, the site of which was devoted to religious worship as early as the Mycenaean period, was first organised in the 7th c. BC. The Homeric Hymn to Apollo and the Odyssey(ca. 700 BC) refer to Delos as a famousIonian religious centre. At this period the area was dominated by neighbouring Naxos, which adorned the island of Delos with buildings and dedications, such as the House of the Naxians, the colossal statue of Apollo and the Lion Terrace. In the 6th century, Paros made its artistic presence felt here for a short period. From the time of Peisistratos, however, the island was dominated politically and artistically by Athens. In the Hellenistic period, a popular cityof about 30,000 inhabitants evolved around the sanctuary. Delos developed into an important port in the central Aegean, and was ultimately destroyed in 88 BC by Mithrodates, king of Pontos. 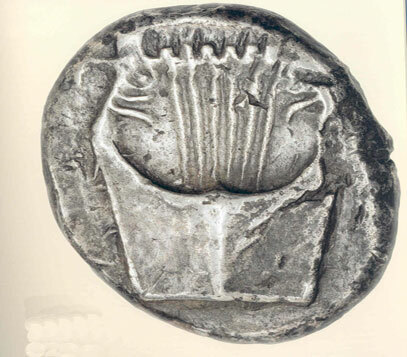 The iconographic type found on the Archaic stater of Delos, dating from the late 6th c. BC, is the six-string lyre, the symbol of the god Apollo. The silver and bronze issues of the Hellenistic period are also inspired by the cult of Apollo and Artemis. The depiction of a palm-tree with a swan sitting on it is probably a recollection of the sacred palm beneath which Leto bore Apollo and Artemis. The presence of the swan denotes that the tree is sacred to Apollo. Silver stater c. end of 6th cencury BC. O. Lyre.